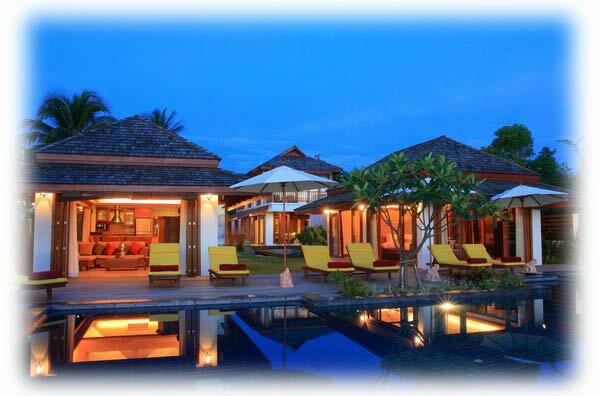 Beachfront Villa in Koh samui, Lipa Noi Beach Thai-balinese style 5 beds, 7 Baths F/F all teakwood, 5*12 m swimming pool. It is located on a sunset private beach, 25 kms from Samui Airport. Land area is 297sq. wa or approximately 1188 sq.m. It has 20 m beach frontage. This villa consists of 2 one-storey buildings in the front (dining room and Master bedroom) and 2 two-strey buildings in the back (4 bedrooms and living room). It also has large pond and sala.